Exposed Aggregate Concrete - Concrete Trimmings Ltd. Exposed Aggregate Concrete is a concrete finish in which the top layer of concrete is chemically removed after initial concrete pouring, thereby exposing the underlying concrete pebbles. What Are Exposed Aggregate Concrete Color Options? 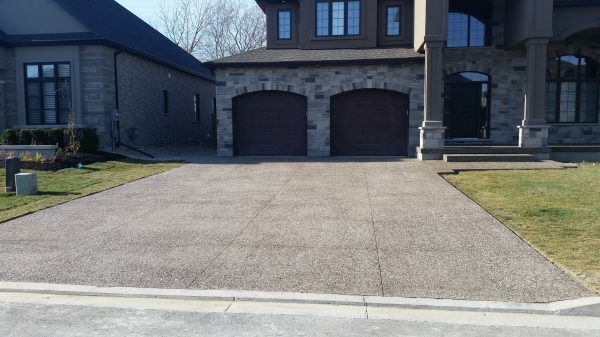 Exposed aggregate concrete comes in a variety of colors to meet your home exterior features and preferences. During your initial Sales Consultation, we will go over color options with you so that you can see and select the color that you like best. Is Maintenance Required For Exposed Aggregate Concrete? Yes, exposed aggregate concrete requires some maintenance since it is a porous substance. Upon completion of your project, we apply a Concrete Sealer to your exposed aggregate concrete which should last a few years. Every year, especially after winter, we suggest that you power wash your exposed aggregate concrete clean and assess whether a new layer of Concrete Sealer should be applied. If you are unsure, please contact us and we will be happy to take a look at your project area and provide you with assistance.